Self-storage, or mini-storage, can make a great investment whether you specialize in real estate, are a tradesperson or an executive looking for growth. We have worked with many owners and franchisees to bring their projects to life. We’ve even invested ourselves. Chateau Storage is our mini-storage facility just to the east of our headquarters building in Braselton. The storage campus has four buildings, including over 250 climate-controlled units and an office for a total of over 43,000 square feet. Of that total, Chateau Storage offers 18 climate-controlled, drive-up units. The latest security includes video monitoring as well as gated entry points and keypad access. To finish it off, the buildings are aesthetically pleasing with custom stacked stone, brick and high-end lighting. A relatively safe investment, mini-storage facilities tend to be recession proof and inflation proof. In tough economic times, folks are looking for a place to store their stuff. Alternatively, in prosperous times, people tend to buy more stuff and need some place to keep it. If you have the right location and good on-site management, the risk is low and the return can be great. For individual investors looking for an alternative to being a landlord, self-storage is considered a relatively safe real estate asset type with many positive characteristics. 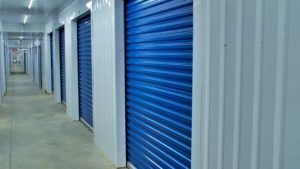 Chief among them is the fact that self-storage is basically the monthly rental of various-sized interior spaces made up of steel walls and a concrete floor – nothing more. Once a renter vacates, the owner or manager can just blow out the space and rent it out again. If the lessee doesn’t pay the rent and doesn’t move out, the contents can be seized under the state’s lien laws and auctioned off, with the proceeds going to the owner of the facility. If you’re considering an investment in mini-storage, let us provide some insight and partner with you for the construction of your new facility. We have been designing custom mini-storage facilities for over 20 years. Whatever you’re looking for, we can help you design and construct a building that is strong and secure, well-appointed and climate-controlled. Click to Get a Quote today.